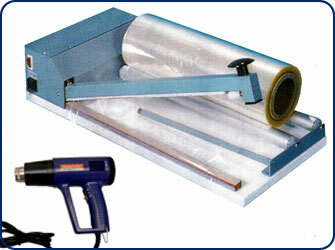 The Heavy Duty Shrink Wrap System comes complete with a deluxe heat gun and a 500' roll of PVC centerfold film; everything you need to begin protecting your product in a crystal-clear package. The entire system only needs one 110V AC outlet. The heavy duty film rollers never need lubrication and the heating element is covered to eliminate smoke or odor when sealing any type of film. Suitable for continuous use. Available in 13, 18, 24, 32, and 40 inch models. The 13, 18 and 24 inch models are available with or without solid-state timers.